Dabbous is a strikingly modern and stylish new restaurant/basement bar set over two floors located in the heart of elegant Fitzrovia, London (39 Whitfield St, London, W1T 2SF [Map]). Situated on a corner, in an area immersed in ongoing works and scaffolding, given that it’s currently attracting more and more businesses, Dabbous’ location first strikes you as brave and pioneering. Dabbous’ décor is certainly no less so. The metal doors, where the establishment’s name features above in simple typography, give a hint of what lies inside. 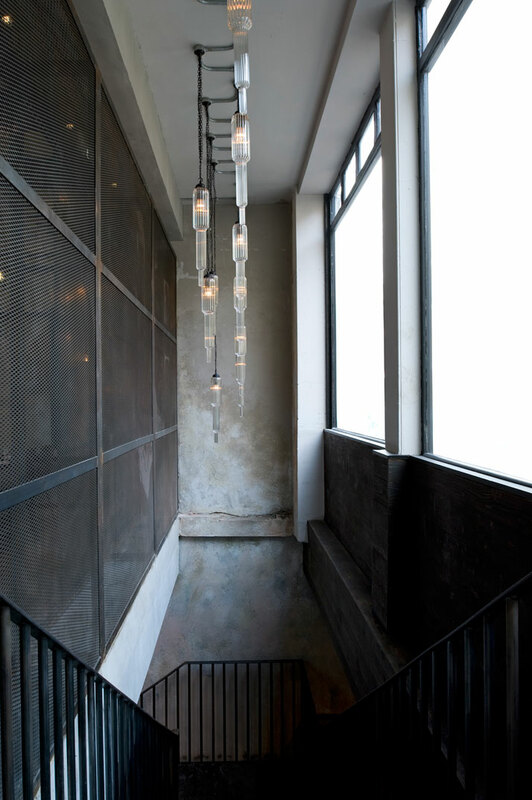 Upon entering, you are instantly struck by the stark and contemporary interior design, as Dabbous has been designed around a raw and uncompromising concept envisioned by owner, British Chef Oliver Dabbous, and realised by the interior design agency Brinkworth. 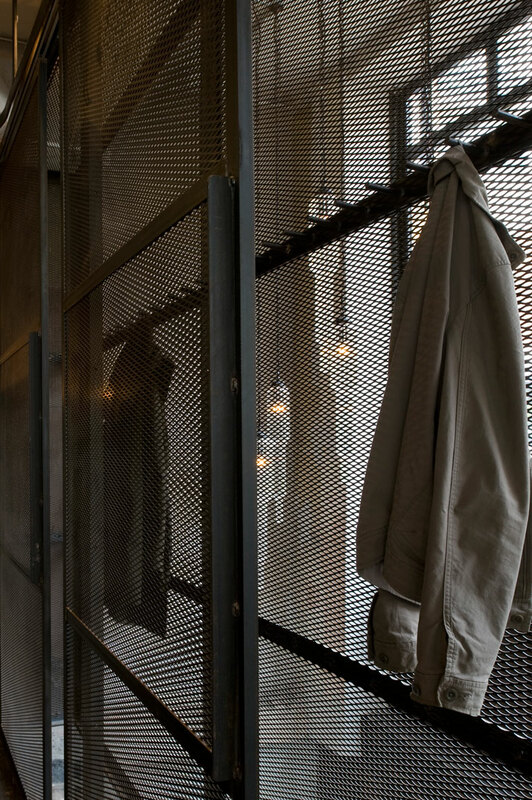 Concrete floors, metal mesh panels and purposefully pared back wall coverings give the space a severely urban feel. 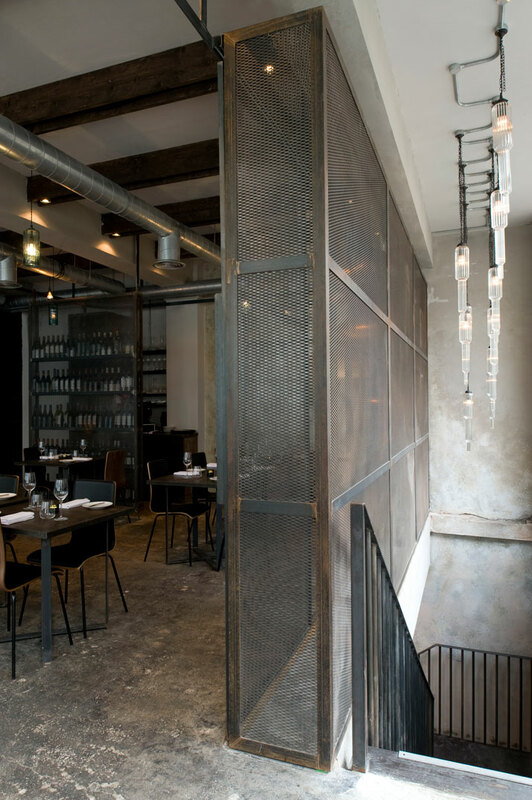 The metal beams and the use of wire mesh wall hangings - highlighted by equally minimal tiered lighting features - all work to further add to the space’s aggressively stripped-back and moody aesthetic. The boldness of the aesthetic in the restaurant bar gives it freshness and youthfulness when compared to the more luxurious and over-the-top venues more commonly to be found in this area of London. 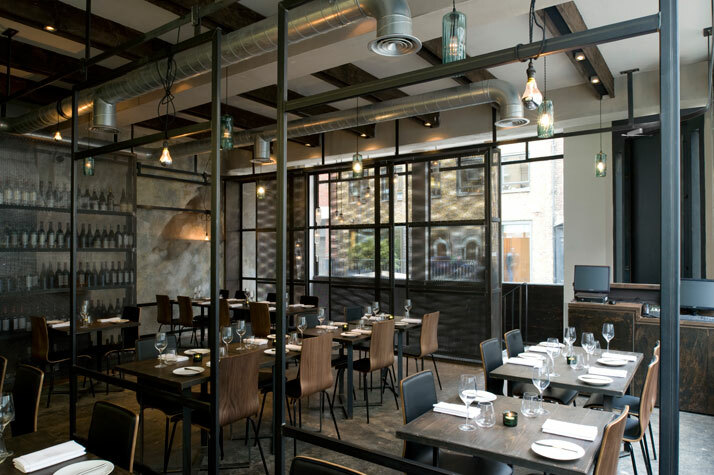 The kitchen sits behind a glass panel and the honest and functional surroundings perfectly showcase its much-applauded modern European cuisine. During the day, sunlight floods into the space through the large windows and bounces around the sleek interior giving a greater sense of space. There is an overall honest and open feel about this restaurant that renders it welcoming and comfortable, despite its intense urban style. At night, the space is transformed, as candle-light reflects upon the abundant textures that range from metal to glass to the stark bricks. This space may be laid back and seem simple at first sight, yet in reality its overall look is finely constructed; the more time you spend in this venue, the more you comprehend how diligently eclectic it really is. 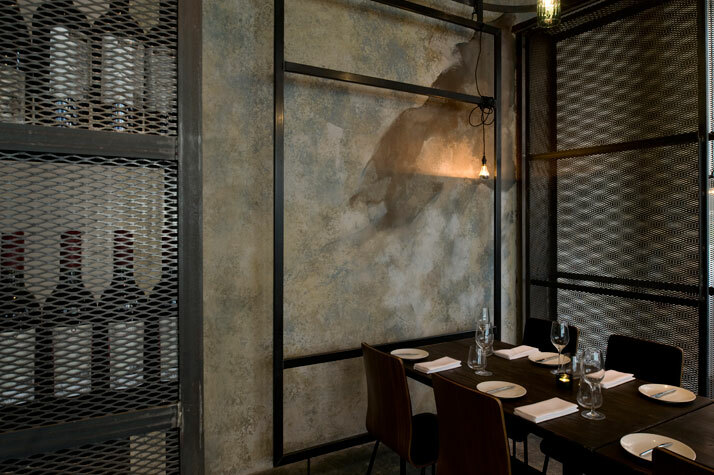 This is achieved by ensuring that all the elements of the restaurant design work together to create an atmosphere that, to an extent, veil its constructiveness through the introduction of organic textures and materials. The industrial, New York style warehouse feel has been made more comfortable for diners by merging it with more organic, Scandinavian design features. The strong wooden furniture is majestic in its form and robustness. Rather than being hidden below a table-cloth, it is contrastingly enhanced by a simple tea light. Overall, Dabbous is definitely not lacking in innovative design elements; there is in fact a wealth of design essentials from the striking array of blown glass lamps to the nod to the 60’s design with the curvy shape of the copper and steel piping. The staircase that takes you down to the speakeasy style basement bar is reminiscent of a fire escape that adds again to its urban vibe. 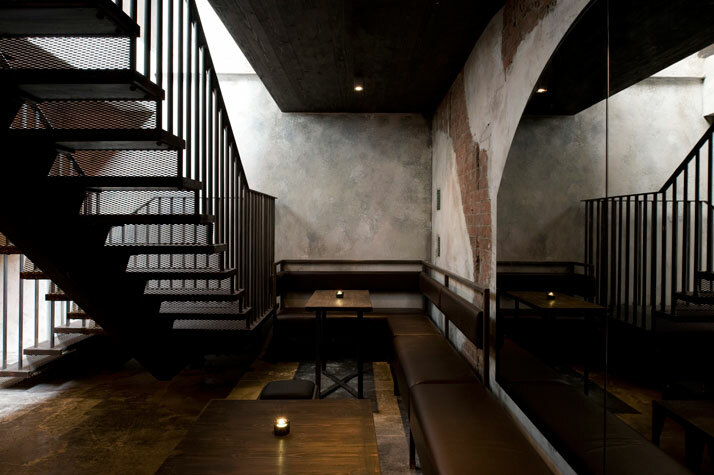 Once downstairs, you encounter a relaxed warehouse style space with a simple bar. The bar has a moodier and even more industrial feel than the restaurant upstairs, but the concept that you were previously introduced to, is now effectively replicated in the bar space. Yet again, there is a contrasting organic feel as a result of the use of raw materials in the contrasting textures, such as timber and bricks under conceptual lighting. Suffice it to say that this space is darker and a little more rock & roll than the upstairs dining room. It’s a good size space and its strong design creates a fun and relaxed atmosphere where you can enjoy cocktails by candlelight seated on timber and steel benches at large tables or on the higher seating at the bar. 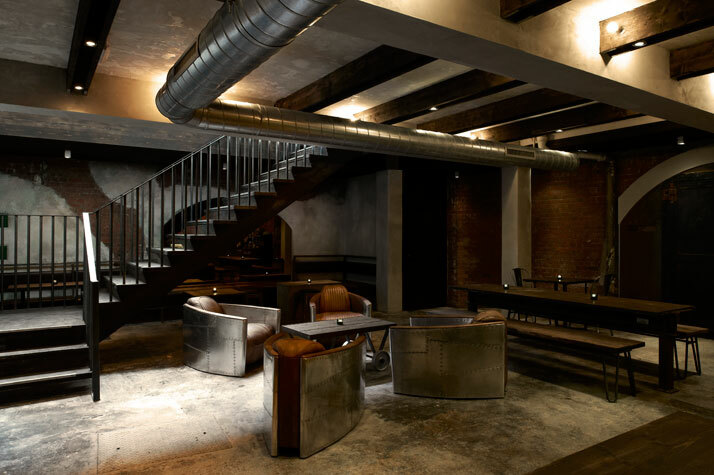 The leather and steel armchairs further accentuate the snug under the stairs. The clever use of space means that the bar has an intimate feel and is an inviting space to socialise and relax over a few after-work drinks. Dabbous seems to be working as its increasing popularity serves as a testament to the pull the more relaxed fine dining is currently having on the London clientele. 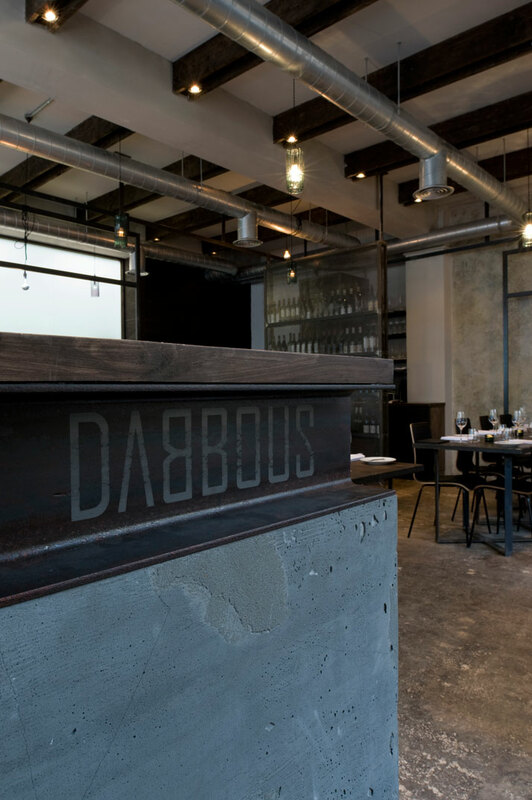 Despite its more traditional and continuously up-and-coming location, Dabbous has become a gastro destination and its basement bar is enabling this new venue to pull in some traffic from the wealth of bars in the neighbouring trendy Soho. 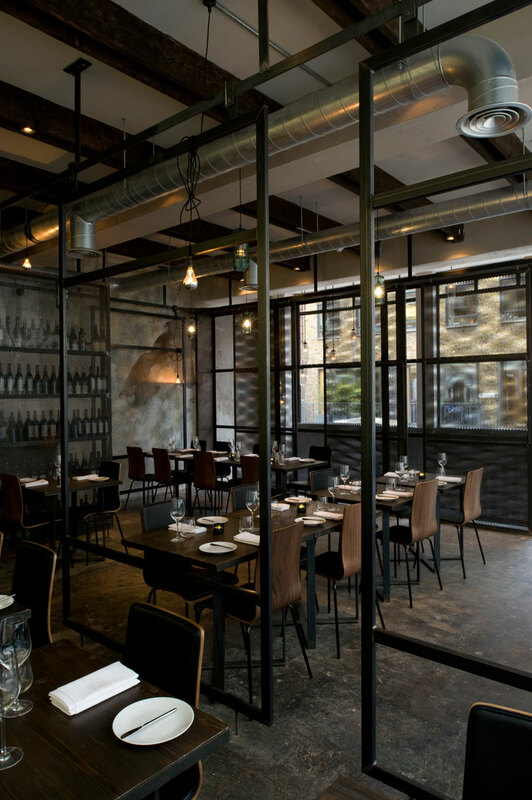 Dabbous offers stripped back fine dining in a relaxed space and is an informal alternative to some of its more opulent neighbours, providing a dining experience that is fresh, young and honest.